Welcome aboard you are now the new kid on campus especially if you’re a freshman and living on campus. So long are the days of being in high school and onto the new adventures that are waiting for you. 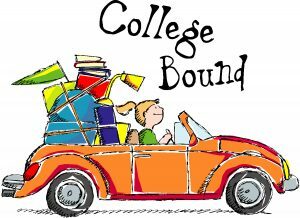 Here are some helpful tips for your move to your campus this advice can be for freshmen, transfer, international or even upperclassman students living in the dorms. 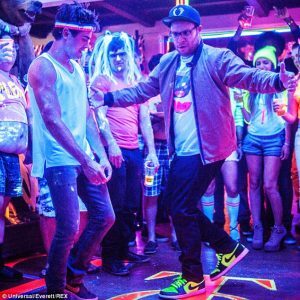 First thing first, let’s clear up the myth that so many hopefuls come to college for….Parties. It might depend on which school you go too; some might have parties more than others. Either way college is nothing like the movies, and if you believe or hope to have the experience like the movies. Hate to break it to you, but you’re in for a rude awakening my friend. 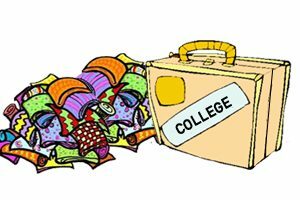 Your school should have already had sent you a list of what you can and cannot bring to live with you on campus. Majority of the things in your room now, you will not be able to bring with you to your college dorm. Of course bring your basics; like hygiene products, towels, clothes for different types of seasons (but not your whole closet), and twin bed bedding décor. Being in such a tight compact space, you’ll learn to be creative what you can and cannot keep in your room. As stated before if you are coming in as a freshman in college and moving into a dorm., space is limited. You have to become very creative on how you’re going to store your essentials and items you were able to bring with you on campus. As a freshman in college your first room will be tight and you’re more than likely will be rooming with someone in that tight space. To utilize the space you have, you can get storage containers! Most college dorm beds sit up pretty high, you can store your containers under your bed. 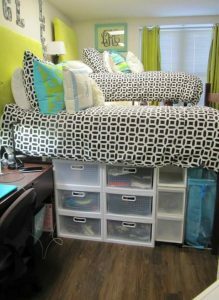 Pinterest has a lot of good DIY (do-it-yourself) ideas on how to utilize your dorm and its compact space. Your college roommate might wind up to be one of your best friends for the rest of your life. Or they can become someone you despise and have stories about for the rest of your life. 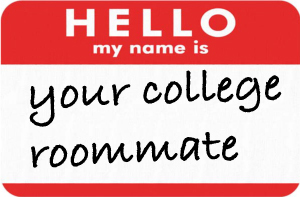 Either or, it’s best to get to know your college roommate before you get to settle in. Some colleges will send you information about your roommate. Huffington Post also has some good information on questions to ask your roommate before move in day. This is a good way to know if you need to bring your own TV (space is limited) or if your roommate is bringing in their own, maybe you can leave yours behind. You can also read our previous blog about Moving in with a Roommate to get more tips! When you do finally settle into your dorm, plan your first home visit! But do not plan it too soon! It’s your first time on your own and you might get a little homesick. You and your parents may have cried on the trip to your campus. But you have this and your family is only a phone call away! Hold out for the first home visit until the holidays. That’s when the campus is vacant and when everyone goes visit their loved ones. When you return home for the holidays the love will be grand and appreciated. This entry was posted in Apartment Moving, FAQ's, Moving Stories, Stress Free Moving Tips, Uncategorized and tagged apartment, big move, campus, check list, college, college dorm, college freshman, dean, diy, dorm, dormmates, dorms, freshman, graduate, life, long distance moving, long distance moving company, microapartments, move, movers, Movers in Dallas, moving, Moving and Storage Dallas, moving companies, Moving Companies in Dallas, moving company, moving stress, Moving Tips, Moving to Dallas, packing, planning a move, rent, residential moving, roommate, roommates, storage, stress free moving, student life, student living, undergrad, undergraduate, young adult. Bookmark the permalink.